Happy New Year!!! Are you ready for growth and to reach beyond the limits? Every year I make resolutions that of course I never keep pass March... so instead of making resolutions I am making goals. Very specific goals! I am going to continue to work on the goals I created in 2016 because that is part of the growing process. If you stop everything just because it is a new year how can you see the results? It is a new year, I am going to grow (not taller..those dreams stopped at age 15 but anyway) and I am going to be ME! No pretending to be perfect and have everything figured out. Some things won't change like me doing the dishes-thank God for dishwashers-, being a workaholic, still liking Hello Kitty, and figuring out how to grow the business everyday. I will grow in many ways this year and those are the days I looking forward too this year. 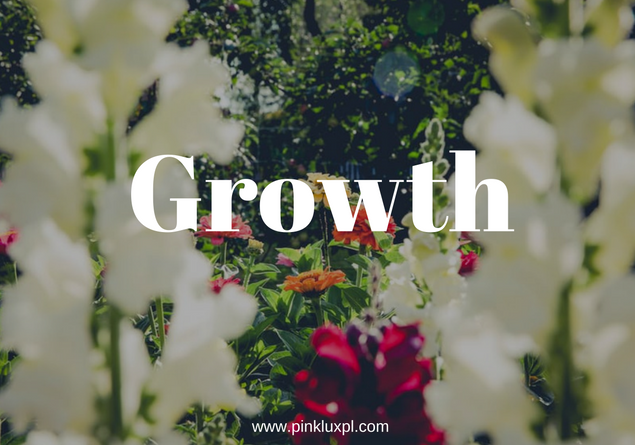 This year I proclaim it to be the year of "growth"! Rather it's your image, wardrobe, relationship, business idea, mentally, or patience it all needs to grow to prosper. I believe all beautiful things have to grow to be successful and that even applies to the person as a whole. 1. I will help 200 paid clients build an authentic image for professional or personal life so they can stop wasting money, feel confident everyday, and shine in their lane. 2. I will hire a team to grow the business and brand. 3. I will book 37 makeup clients a month. 4. I will read 3 new books a month pertaining to personal growth, business, and non-fiction. 5. I will go home to see my family in Indiana. 6. I will speak at a women's conference. 7. I will lose 50 lbs. and keep it off. 8. I will launch the second round of "Power of Image" and have a 5 figure launch. 9. I will have a bigger and better Inbetweenie/Plus Size fashion show. 10. I will be featured for the business and/or brand in B-Metro and mainstream magazine. 11. I will be consistent on the blog and increase monthly readers to 35,000. 12. I will grow the current and new relationships built. 13. I will have peace and joy no matter the trials or tribulations in 2017! 1. What was the smartest thing you did last year? 2. List 2 things that you NEVER want to have happen again (if possible). 3. Identify 3 very high stress moments. What could have made those times a little easier? 4. What 4 things went really, really well? Why? 5. List 5 things you did last year that you could do better. 6. Out of everything you did last year to help other people, what 1 thing made you feel the best? I will be perfecting everything I learned last year and applying it to my growth process. Will you join me? Join the free Facebook group to get accountability, beauty tips, fashion tips and be apart of women who get it! Until next time...Stay Lux, Be Unique, Be You! Your goals sound incredible! I love that you added the "I will," maybe that's something I need to implement for myself. Great post! Your Image Matters More Than Ever!